The following C# code example shows how to use COM interop to create an Excel file. Before going to create new Excel file programmatically in C#, you must have Excel installed on your system for this code to run properly. 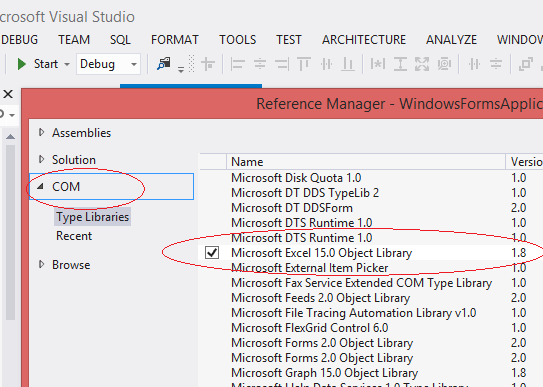 To access the object model from Visual C# .NET, you have to add the Microsoft Excel 15.0 Object Library to you project. Create a new project in your Visual Studio and add a Command Button to your C# Form. Form the following pictures you can find how to add Excel reference library in your project. 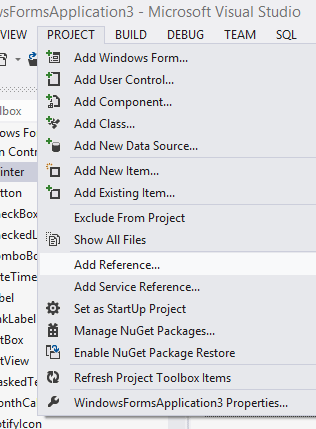 Select Add Reference dialogue from Project menu of your Visual Studio. Select Microsoft Excel 15.0 Object Library of COM leftside menu and click OK button. First we have to initialize the Excel application Object. Before creating new Excel Workbook, you should check whether Excel is installed in your system. In the above code we write the data in the Sheet1, If you want to write data in sheet 2 then you should code like this. After write the content to the cell, next step is to save the excel file in your system. Interop marshaling governs how data is passed in method arguments and return values between managed and unmanaged memory during calls. Most data types have common representations in both managed and unmanaged memory. The interop marshaler handles these types for you. Other types can be ambiguous or not represented at all in managed memory. It is important to note that every reference to an Excel COM object had to be set to null when you have finished with it, including Cells, Sheets, everything. The Marshal class is in the System.Runtime.InteropServices namespace, so you should import the following namespace. Note : You have to add Microsoft.Office.Interop.Excel to your source code.